There’s been a lot of talk around here in the last few weeks about commencement, academic processions and the use of landscaping to create the quad where it all takes place. As I’ve been working all this out I’ve frequently found myself staring quite hard at photos I’ve seen many times before, searching for clues to questions I only recently became aware of. One of these pictures turned out to be particularly arresting, although it was taken so early that it sheds no light at all on on any commencement issues. It says on the back that it was taken in 1912 and I’m totally convinced that that’s right. It shows a campus that’s still absolutely raw. I looked at it for a long time, puzzling over the two little structures at the end of the newly planted hedges. It was only after I scanned it and blew it up that I realized how much is going on here. Click on it to zoom in, then click again to expand it. There’s an incredible amount of action in this image–and nobody here stopped to pose for the picture so much of it is blurry. I hardly know where to begin so I’ll just point out a couple of things and let you enjoy it yourself. First, on the left side you can see a bit of smoke, maybe from burning trash, and there are a couple of horses (not mules!) over there too. More interesting to me is the sawhorse perched on top of the manhole cover right where the gravel walk meets the road across the quad. The right side is even busier–several wagons are moving and there’s a team further out that’s kind of fuzzy but looks to be plowing right where Anderson Hall is now. Way off towards the spot where the RMC is today you can see quite clearly an entire crew working on the road. My vote for the best thing in the picture, though, goes to the small, lone pine tree that you can see if you look to the right of that crew. So what do you think those two little structures are for? Hey, there’s that road across the quad! It’s hard not to think that the structures aren’t some kind of transit shelter; wonder if there was an early shuttle bus-wagon-thingie. I immediately thought, an arbour…that’s probably the way they spelled it then. They both look fairly festive with the striped awning cloth coverings. 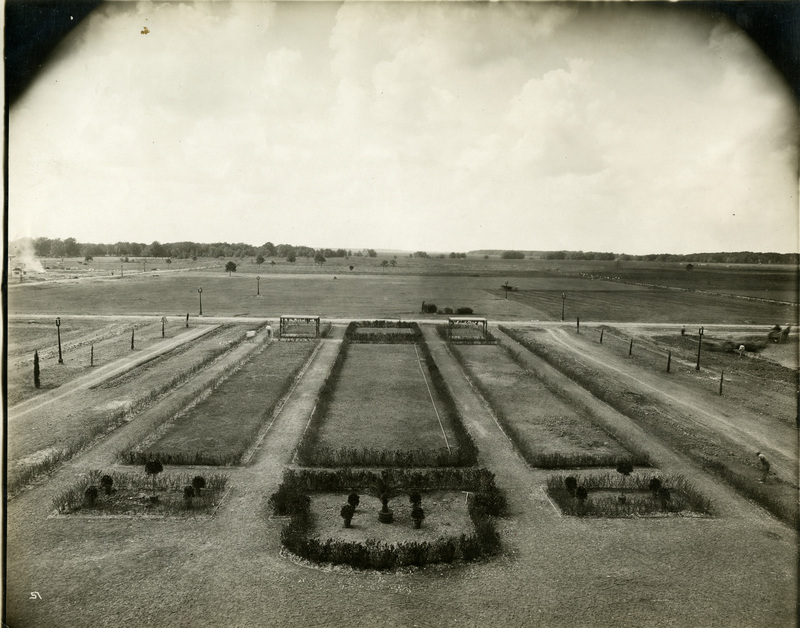 Love the enlargement of the new Rice quad/hedges from 1912…and all of the surprises. I did briefly wonder why there were so many UFOs buzzing about in the sky…OK, maybe not. They’re just old film anomalies and blobs of things on the picture, but it was fun to think about it. The two structures are arbours–or pergolas–you can see vines growing on the uprights and growth hanging down from the canopy. Why? Dunno. 1 is for eating lunch in the shade. 2 is for eating bread and drinking wine with your sweetie. These have spiffy canvas covers. Pergolas usually don’t have canvas covers, they are open to let the sun in for the plants. And how did they get the plants to grow all the way up and over the top when the hedges are spindly and new? It usually takes a few years to get a vine up and across. Finally, they seem to have floors, but no benches. I’m guessing they were brought in for some specific purpose, garden party, who knows what. Those might be garlands, not permanent plants. Would these structures have anything to do with keeping owls on campus? I love the windmill in the far right of the picture, Thanks for sharing. I think I see our landmark live oak tree to the right of the lone pine. You know, the live oak that is between Space Science and the road today. I’m thrilled to see it was there in 1912! It looks to me like the quad is still in the process of being planted. Notice the loose dirt among the hedges to the right, and several shovels lying about. There is even one stuck in the ground near the structure on the left. Perhaps the structures provide shade for the workers to rest when they take breaks? It looks like there is a trench on the left where a set of hedges will be planted soon. The corresponding area on the right doesn’t even have a trench yet. What is the structure at the far left-hand side of the picture, to the left of the burning trash and smoke? If you look along the front, there are plants in pots waiting to be planted. I don’t think that palm tree right in the center front lasted long. I seem to remember one of your early commencement photos from last week that had a white planter with a shrub in that location instead. Overall this is a totally fascinating picture of the very early days of the quad. Why do they have floors in them? At least that looks like a floor — smooth, level, maybe even slightly off the ground. My initial reaction was that the stuff hanging was being dried. But Sandy’s right, there are vines spiraling up the “legs”.